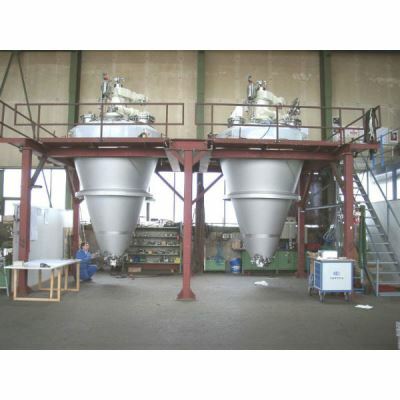 The conical screw dryer is a vacuum contact dryer that is particularly suitable for drying hazardous and toxic products containing solvents or water, to a very low final moisture content, due to its closed design and indirect product heating. As a result of its unique, very gentle mixing characteristics, even mechanically sensitive products are not destroyed; the product quality after the drying process is reproducible and as good as that of the initial product, whereas the driving force required is very low. The achievable, high vacuum ensures low drying temperatures (a clear advantage when drying temperature-sensitive products), good heat transfer and short drying times, while at the same time requiring little energy. The short drying times and the high level of the fully closed system make the conical dryer the best choice in cases in which environmental and/or product requirements are strict. A directly fitted filter retains the dust particles in the processing space. Complete discharge and easy output ensure that you can continue to process your valuable products without a loss. Not just the solids, but also humidity and solvents can be recycled by the vacuum unit that has been integrated into the closed containment system. 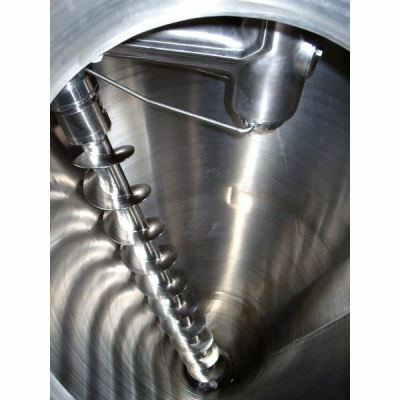 The BOLZ-SUMMIX conical screw dryer and mixer both use the tried and trusted system of a rotating, self-supporting mixing screw. 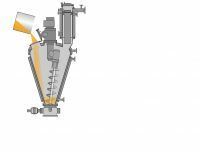 It is only attached at the top to a rotating swivel arm, which moves it as close as possible along the walls of the container, thus ensuring intensive but gentle mixing of both powders and other, comparable bulk goods. The complete drive unit consists of a drive system with separate motors for the arm and the screw, located at the top and centrally within the lid. 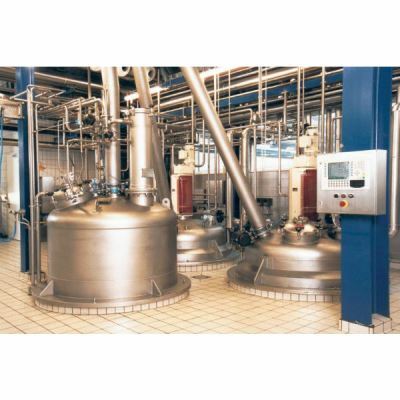 The easy maintenance and exchangeability of the systems was one of the main specifications for the standardisation and design of the BOLZ-SUMMIX conical mixers and dryers. Our modular and cartridge constructions for seals and bearings, together with the robust construction of the drive and swivel arm, ensure maximum availability and minimum downtime. The drive principle can be implemented either by means of a bevel gear or a belt drive. Both are proven technologies that have been used with great success in many installed systems. Each design has its own, special characteristics, its own advantages and a wide range of applications. The transmission of force from the screw motor to the screw takes place via a shaft and bevel gears. The transmission of force to the screw takes place via an arm and an oil-free drive belt at the upper end. 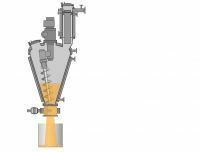 Before filling any solvent wet products into the Cone screw dryer the equipment is inerted with nitrogen. This eliminates all oxygen and guaranties, that an explosive atmosphere inside the dryer is safely avoided. 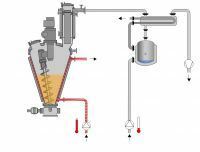 After inerting the dryer, a centrifuge wet or nutsche-filter wet product (like cake, solid or powder) is filled into the dryer. To increase drying efficiency, the pressure inside the dryer may be ramped down to maximum vacuum level in steps whilst heated with an appropriate temperature. The entire dryer is heated via jackets plus the option of a heated screw. 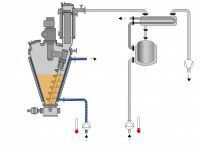 During drying the agitator is operated at variable speed and keeps the product in motion. The dryer is kept under vacuum and heated with the maximum uncritical product temperature, till the requested final LOD level is achieved. When the drying process is finished, the dry product is cooled down to an acceptable discharge temperature. 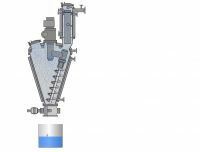 The dry and cold product is discharged via the bottom discharge valve into a bin, container or conveying system by gravity, assisted by agitation of the screw and arm without leaving residues at a high yield. For cleaning the equipment internals between individual batches, or before a product change, fix welded or retractable spray nozzles will spray a cleaning liquid to the entire inner dryer surfaces. All product exposed or contaminated surfaces are wetted, washed down and rinsed with cleaning liquids or water. This guaranties an efficient and total cleaning of the fully contained dryer internals. Built and tested for all pressurised vessel regulations such as the pressure vessel directive, ASME, JIS, etc. and calculated according to AD-2000, ASME Code VIII, CODAP, SVDB, etc. Add-on components such as samplers, sprinkling ring, etc..
A range of variants for the screw, such as pharmaceutical screw conveyors, heated shafts or double-walled flights.